Hi friends!!! I hope you all enjoyed the first weekend in June!! I thought it would be fun to link up with the ladies over at The Blended Blog for their monthly chat. This month is all about Summer favorites! 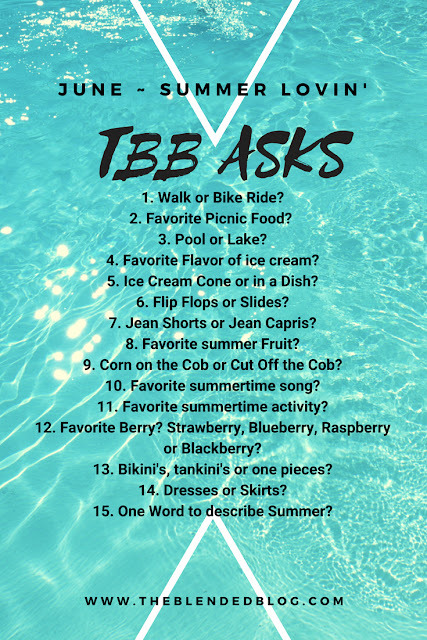 I mean Summer is my favorite time of year, so this was a fun list of questions! Walk, but really run! I love to get in a nice run with my girlfriend on Sunday mornings. I wish I liked riding my bike more.. I just get so nervous riding it! I know it sounds crazy, but I am so uncomfortable riding, I always feel like I am out of control! Maybe I need to ride more to get comfortable! Watermelon. In my mind, nothing beats a slice of cold watermelon in the Summer!! On the boat...floating in the lake. Hmmm.. hard ice cream is probably mint chocolate chip, but when we go out for ice cream I always order soft serve custard. Flip flops all the way. Ipanema are my favorites!! Up until a few weeks ago I would say neither, but I found the most amazing pair of jean shorts. Watermelon. I think I already mentioned that!! Off the cob... which even to me sounds crazy to type that. I have sensitive teeth, so I prefer to eat it off the cob. And I love it in our clambake!! It's pretty simple and it all cooks in little packets on the grill! Anything by Jimmy Buffett, even better if it's heard live at his concert!! 12. Favorite Berry? Strawberry, Blueberry, Raspberry or Blackberry? Strawberries by themselves or in a dessert. Blueberries & raspberries in my yogurt. These Strawberry Oat Bars are one of my favorites to make. They are made with some simple ingredients and are perfect as a treat after school or for something sweet with brunch. You can easily sub in any berry... I have made them with raspberries too and they are delish! You can grab the recipe here. ps...I don't do the vanilla glaze...they are sweet enough with the berries. 13. Bikini's, tankini's, or one pieces? All of the above?? Ha! I love the look of a one piece, but the other two are way easier... using the bathroom in a wet one piece is not fun. I love me a good summer dress! And this one right here is perfect! It's under $40 and comes in 4 colors. It would be so cute with a jean jacket on cooler nights too. What are some of your favorite Summer things to see, do or eat??? Gosh this list has me so pumped up for Summer!!! Be sure to stop back tomorrow, I am a sharing a great recipe for an easy and pretty grain bowl. And then Wednesday I am sharing my May book review- I read 5 awesome books! See you soon, there's always room for one more at our family table. Thanks!! It is the perfect Summer dress! That looks amazing to be floating on the boat on the lake! I'm glad you were able to find that perfect pair of jean shorts for summer! Having a go to pair makes life so much easier! Yes I was so pumped to find some great denim shorts! I love to float around on the water. It's so relaxing. So relaxing right?? The water is so calming! Great point about using the bathroom in a one piece haha! Its only downfall! And I'm definitely checking out those denim shorts immediately. I have such a hard time finding a good pair. I know.. it's not an easy task!! And I def think you should give those shorts a shot! I have that dress and it is the best for summer! Isn't finding the right pair of jean shorts just the best feeling? Jimmy Buffet and being on a boat scream summer! The perfect Summer Dress!! Yes...Buffett & boating = perfection! Love that dress. Man I forgot to answer the song question, oops! Finding jean shorts is the best. You know I've never been on a boat in a lake before...need to change that...Thanks for linking up with us! Never on a lake? Yes..you need to put that on your to do list! Happy Summer! Ice cream with sprinkles is so good! Hands down, my all time favorite! I love all of Jimmy Buffet's songs! And floating on the lake sounds wonderful. Thanks for linking up with us today! I know right, his songs just make me feel relaxed and happy! Thanks for the link up! Yes to Jimmy Buffett for summer music! I can't wait to check out your book review - I just posted mine yesterday. Hope you are having a wonderful summer! Oh I have to go check out your review! Summer reading is my favorite! Rainbow sprinkles on soft serve is the best! You're right about watermelon! Both are my favorite Summer things! !